Given that Scott Park heads up one of the world’s largest construction equipment manufacturers, it seems only fitting that he has a well-stocked toolbox. The president and CEO of Doosan Infracore Bobcat Holdings has been adding to it since college. In earning a B.S. in engineering from Harvey Mudd College, Park picked up his technical tools. Then at the School of Global Policy and Strategy (GPS), he acquired some qualitative management tools. Through working in areas such as purchasing, sales and business development in the U.S., Asia and Europe, he’s honed the global components of those tools over the years, he said. Such experiences are all a part of Park’s “toolbox concept,” which he adopted some time ago to help guide his career. 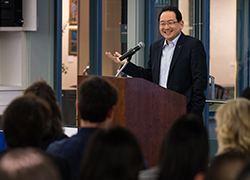 It’s a concept Park not only has seen personal success with throughout his career, but one he openly shares to others along with other advice—particularly now as GPS’s 2015 Alumni of the Year. The School honored Park with the award at its 2015 Friends & Family Commencement Reception, held June 12. Look no further than Park’s resume to see his pattern of promotions, foremost at Doosan. After graduating from GPS, he worked in consulting for companies such as Oracle, e-Xperts Solutions and SAP. He went on to work at Volvo Construction Equipment for nearly 10 years prior to joining Doosan in Seoul, South Korea, in 2012. 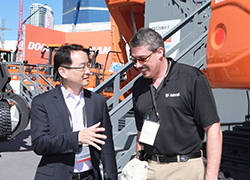 In his three years at the company, Park has jumped from vice president of global manufacturing strategy and total quality management to chief strategy officer and now president and CEO, plus chairman of the board for Doosan Infracore International. As CEO, he oversees Doosan’s $4 billion revenue, 90 percent of which is outside of Korea, meaning he travels a lot. To that end, he’s also kept mindful of the “do the right thing” part of his motto to generate results for the company, his team and the community—the latter of which, Park said, he found value in at GPS. He instilled this at Doosan just last year through the creation of a “Doosan Day of Caring,” a day when the entire company committed itself to community service. The initiative, in fact, went over so well that the company now commits two days per year to volunteering instead of one. It held its second community service day earlier this year. Outside of Doosan, Park also is giving his time back to GPS. This year he was invited by Dean Peter Cowhey to serve on the International Advisory Board, which was formed in 1986 to aid the dean in achieving the vision and mission of the School. Members provide counsel on current issues that affect GPS’s role as an established leader in the region. Park joins fellow alumni Hong-Chul "Hank" Ahn, MPIA '91, Brooke Partridge, MPIA '91, Jeff Rector, MPIA '97, and Yiru Zhou, MPIA '93.